Welcome to Coffee Pot Reviews! These are short and sweet reviews done in the length of time it takes my coffee pot to brew! I have two yummy adult books to share with you. One is a novella and the other a serial/full length novel. Adult books contain mature content and are not intended for readers under 18 years of age. I've got iced peppermint-mocha coffee so grab a cup and enjoy! Lady Lydia Rothermere has spent the past decade trying to make up for a single, youthful moment of passion. Now the image of propriety, Lydia knows her future rests on never straying outside society's rigid rules, but hiding away the desire that runs through her is harder than she could have ever dreamed. And as she prepares for a marriage that will suit her family, but not her heart, Lydia must decide what's more important: propriety or passion? Simon Metcalf is a rake and adventurer. But for all his experience, nothing can compare to the kiss he stole from the captivating Lydia Rothermere ten years ago. Simon can scarcely believe he's about to lose the one woman he's never forgotten. The attraction between them is irresistible, yet Lydia refuses to forsake her engagement. With his heart on the line, will Simon prove that love is a risk worth taking? I adored Seven Nights in a Rogue's Bed, the first Sons of Sin book and was excited to be able to read Days of Rakes and Roses. This was a short and sweet novella and perfect to hold me over until the release of A Rake's Midnight Kiss in August. In this delightful tale of rekindled love we meet Lady Lydia Rothermere who has spent the past ten years trying to atone for one moment of unbridled passion all while nursing a broken heart. She decides to marry a safe and reliable chap and perhaps give her heart to children. All of her plans are upended when Simon Metcalf the man who stole her heart returns and begs her not to marry. Campbell's characters quickly captured my heart and I fell in love with the irresistible and charming Simon. Lydia was humorous as she tried to think with her head and not her heart. This was a delightfully quick, feel good read that left me with a smile. A perfect rainy afternoon escape. While it is part of the Sons of Sin it can easily be read as a standalone. As leader of the elite counter-terrorism team Omega Force, former army ranger Jack “Kell” Kellison is always focused on getting the job done. So when a Houston high-rise is bombed and the governor killed or missing, Kell’s mission is clear: infiltrate the group suspected of the bombing and neutralize the threat by any means necessary. But once Kell meets beautiful chief suspect Mori Chastaine, he realizes there’s more to this case than meets the eye. And more to Mori than any man—any human man—could imagine. Mori Chastaine is running out of options. Suspected for a crime she didn’t commit, forced into a marriage she doesn’t want, she sees no escape—until Kell walks through her door. A lifetime hiding her true nature warns her Kell might not be who he seems. But he could be the only one able to help save more innocent humans from becoming pawns in an ancient paranormal power play. If Mori reveals her secret, will Kell join her fight? Or will she become his next target? 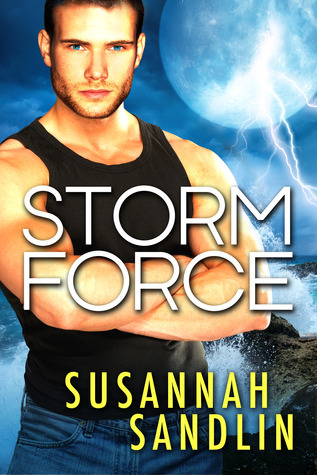 I love Sandlin's Penton series and was excited to read Storm Force the first book in her new Omega series. Take one part shifter, one part human, and an ex-Army Ranger and shake - creating a secret elite-counter terrorism team. The results a dynamic team that you cannot help but fall in love with. I immediately liked Jack "Kell" Kellison the leader of this elite group. He is one hundred percent human and completely swoon-worthy. He is new to the idea of shifters and the paranormal world in general and this created some great banter and a little humor. The shapeshifting side of the team consists of brothers Archer and Adam who are jaguars, and Robin a snarky eagle shapeshifter. The human side of the team are Kell the leader, Garrett a computer/techie geek who is pure genius and Nik who has the unique ability to touch objects or people and get images and history. Nik is Kell’s best friend and I loved how they had each other’s back. The brothers are yummy but my favorite character was Robin. She is snarky, smart and fearless. The interaction between her and Kell was hilarious. Sandlin gave us a fantastic villian with his own elite team and they kept me on edge. When a building is bombed and the mayor assumed dead, the team is called in to investigate. An anonymous tip steers them towards Mori Chastaine the head of an environmental protest group. Kell goes undercover as a volunteer and quickly realizes there is something more going on. The tale that unfolds is suspenseful and action packed with a side dish of romance. Mori is complex and I enjoyed learning about her secrets, and seeing her grow throughout the novel. The romance was sweet, and felt genuine. I enjoyed the pacing, and the dynamic characters. Sandlin quickly had me invested in this elite team and its members; I cannot wait to dive into the next book. I won Storm Force, and am looking forward to reading it. Glad you enjoyed it. wait till you meet Robin..i loved her snark! I am especially curious about Storm Force! I love reading about shifters so this one is definitely going on my TBR pile/wishlist. Storm force sounds good. They both do, really. :) Thank you. Yes it is Heidi she did the Penton series I loved so much with vampires under Sandlin and Sentinels of New Orleans under Johnson. Isn't that by the same author who writes the Sentinels of New Orleans I know she writes under two names. Both books sound like great reads! Have a wonderful fourth! we are going to be with family...the weather is suppose to me nice and hope you read both of these! I enjoy Anna Campbell's books a lot. She's put out quite a few good romantic-strike that-STEAMY stories & characters! Storm Force sounds good too! thanks Jenea..i will be popping on and visiting when I can sneak on! They both sound really good. I hope you are having a fantastic time away. Happy 4th!!! yeah I am a sucker for military type too! the novella is a perfect one sitting read and Sandlin totally rocks..read her Penton series too! I love Susannah..one of my favorite peeps! You have to read Storm Force and the Sentinels of New Orleans! I am so excited about the Sentinels extension and cannot wait for more of Storm Force! Storm Force does sound tummy:) You had me at ex-Army ranger ! Usually, paranormal romance gives me allergies, but since I'm so tired of just about every genre imaginable and this (Storm Force) sounds so delightfully funny, I might just give it a chance. It's just not in me to resist elite soldiers, and boy, Kell sounds like someone I'd like to meet. These do sound delightful....thanks for sharing. I love the idea of "short and sweet" reviews. Oh, I hadn't read any reviews for Storm Force, but I've been curious about it. You definitely have me anxious to give it a try! I haven't read Sandlin yet, but this sounds good. I'm trying more romantic suspense again and a 4 1/2 is a pretty good endorsement. Great review, chica! Awesome reviews! I love Susannah's Penton series too, she is an awesome author. I will have to get Storm Force. It sounds like a great new series!! I can't help it, I love Jean!! OMG yes I love them!!!!!!!!!!!!!!!!!!!!!!!!! I read Storm Force when it came out in the serial issues and I have yet to finish it! Gah. some how I got behind on it but I really liked what I read. Have you tried her Sentinels of New Orleans series? Soooo good too (under the name Suzanne Johnson).